How to use a 3D printer in your classroom, even if you’re not a tech teacher. 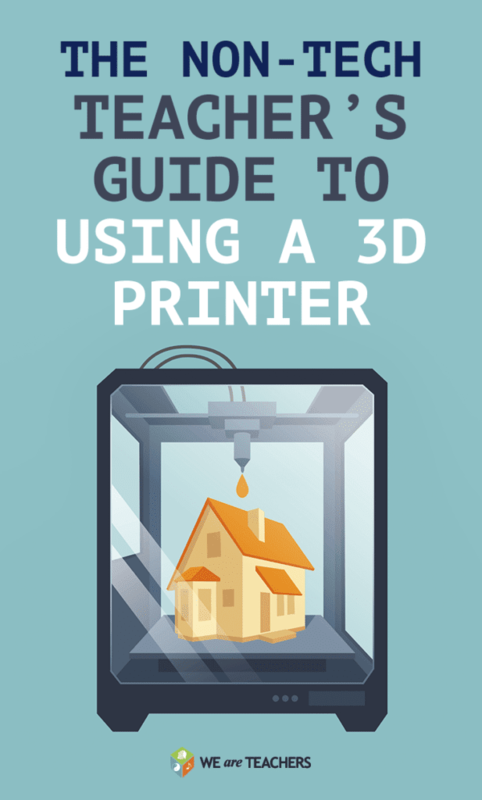 Download our FREE resources for 3D printing in the classroom! Sure, a 3D printer sounds cool. But doesn’t it require a lot of money, time and technical expertise to get one set up in your classroom? No. Prices have come down. Equipment and ease of use have improved. And as more educators incorporate 3D printers into their curriculum, there is an abundance of resources to help even the least tech-savvy teacher plug in to this new technology. As with anything new, there is a learning curve. However, it’s clear the effort is worth it when you see how excited kids get about the possibilities and the process. OK. But let’s start simple. REALLY simple. What is 3D printing and how does it work? 3D printing is a process in which solid 3D objects are created, layer by layer, from a single digital file. You can start the process by designing an original object with a modeling program, downloading a 3D template from a website such as Thingiverse or YouMagine, or using a 3D scanner to measure and produce something in the real world. A computer-aided design (or CAD) modeling program can be used to design or modify a 3D object. Tinkercad and SketchUp Pro are popular, free online programs among educators, and they both offer basic tutorial videos that even newbies can understand. Just as an inkjet printer uses ink cartridges to print, a desktop 3D printer uses plastic filament, which is available in a variety of colors and sizes. Filament comes in two main types: ABS and PLA. Many educators recommend looking for a printer that uses PLA filament because it is nontoxic and safe to use in the classroom, whereas ABS filament produces strong fumes. What do I look for in a 3D printer? It depends on your needs. Desktop 3D printers come with a wide variety of features and there’s a huge range in price. You’ll want to keep the cost of filament in mind as well. Simpler desktop printers start around $300, and these are often perfect for classroom use, says Briggs, who also notes that a good scraper to remove the finished product is key. Be sure to get a machine where students can easily view the printing process, adds Sam Patterson, a Makerspace coordinator at Echo Horizon School, an independent preK–6 school in Culver City, California. “To students, it seems like magic. There is nothing and then there is something. It’s incredibly engaging to watch a 3D object being printed—a new version of watching digital paint dry,” he says. “It can be kind of hypnotic,” agrees Briggs, as well as a learning experience to understand the design being constructed layer by layer. Finally, these educators agree that you want to buy from a company that offers strong customer support, particularly for those in the education space. So we have a 3D printer. Now what? I don’t have time to learn something new! We get it. Your time is limited and getting started with 3D printing can seem intimidating. That’s why David Saunders, director of the middle school library at Greenwich Country Day School in Greenwich, Connecticut, recommends not starting from scratch but rather finding a simple object online, downloading the template and making a few small edits to start. Saunders also displays students’ creations throughout the library so that interested teachers can browse and find ways to connect 3D printing to their lessons. Briggs offers another solid reminder: Most of your confidence will come from doing. “I believe in just jumping in with two feet and learning,” he says. What are the best subjects for 3D printing? How can I incorporate it in my lessons? The best 3D printing projects use a problem-solving framework that allows kids to explore. “When they are excited about building something they care about, it’s infectious,” says Saunders. For instance, in a math class, students can use their measuring and geometry skills to come up with a solution to a problem they identify. Or when studying civics, students might think about how they can use 3D printing to solve a problem in their communities. Just about anything a student wants to create on paper or with cardboard and duct tape can now be expanded and refined with 3D printing technology. You may begin with an easy download, copy and print of a key chain, for instance. But as students gain experience, they will likely think bigger and want to do something more elaborate. Some teachers are reluctant to try new technology such as a 3D printer because they fear the investment of time and money involved and are overwhelmed by jargon, says Briggs. But help is nearby. “We do have all these professionals in the room: our students,” he says. when studying civics, students might think about how they can use 3D printing to solve a problem in their communities. Just about anything a student wants to create on paper or with cardboard and duct tape can now be expanded and refined with 3D PrintersRepairNearMe technology.